Over the course of his 25-year career as an anesthesiologist and intensive care physician, Jean Jacques Charbonier, M.D., gathered hundreds of accounts of patients who returned from clinical death. Across all of these accounts—from patients with vastly different backgrounds—Dr. Charbonier found striking similarities as well as indisputable proof that these experiences were more than hallucinations. He surveyed other physicians, nurses, and professional caregivers and discovered that their patients described the same experiences as well as exhibited the same positive life transformations afterward. Igniting a scientific quest to learn more, he collected more accounts of near-death experiences as well as out-of-body experiences, attended dozens of sessions with mediums, experimented successfully with electronic communication with the deceased (EVP), interviewed hundreds of people who have cared for the dying, and gathered countless inexplicable stories of “signs” from the afterlife. With each experience he studied, he found himself more firmly believing in the survival of consciousness beyond death. 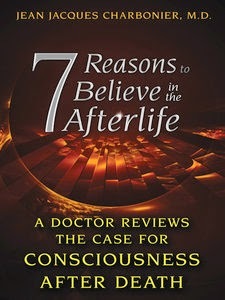 Dr. Charbonier distills his findings into 7 reasons to believe in the afterlife, beginning with the more than 60 million people worldwide who have reported a transcendent afterlife experience. He refutes the standard objections of doubters and materialists point by point, citing scientific research on NDEs and the work of pioneers in the field of consciousness studies such as Raymond Moody and Pim van Lommel. Drawing on meticulously recorded and hospital-verified cases, Dr. Charbonier explains that we should not fear death for ourselves or our loved ones. By releasing our fear of death, we can properly prepare for “the final journey.” As those who have returned from death reveal, death is simply a transition and its lessons enable us to live more fully, peacefully, and happily in the now.